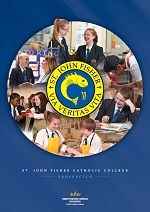 Parents who have a child in Year 6 and wish to apply for admission to St John Fisher Catholic College for Year 7 need to contact their relevant local authority. Parents who have a child currently at St. John Fisher but who wish to apply for a place at another school need to complete the application form from Staffordshire county council http://www.staffordshire.gov.uk/education/schoolsandcolleges/admissions/admissions.aspx and return it to the school for the attention of the Headteacher. If your child has been baptised as a Catholic please provide a copy of your baptism certificate with your application. If you wish to transfer from another school please ensure that you and the headteacher of your child’s current school complete section 4 on the application form. The St John Fisher Catholic College Admissions Policy has been updated for the year 2020-2021. The updated policy can be found by clicking the above link. Please contact admissions.sjfcc@ctkcc.co.uk with any questions or comments.